In an article from The Christian Science Monitor titled "Return to the bike? Hard sell in Beijing" by Peter Ford reports on The Beijing Bicycle Rental Company's efforts to get Beijingers (Beijingians?) back to their biking roots. 'The service costs 5 yuan ($0.66) an hour, 20 yuan ($2.66) a day, or 100 yuan ($13.33) for a year-long VIP card. 'The longer you rent, the cheaper it gets,' Wang says, 'because we want to encourage people to use a green mode of transportation for longer. I see this as a public-service business.' " This is a different model from other bike-sharing services, but I like it! 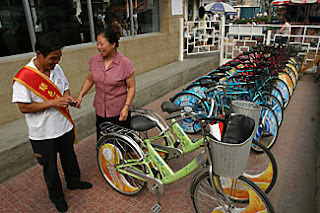 Presently with 31 stations and 500 bikes, Mr. Wang hopes to have 200 stations and 50,000 bikes by the end of 2008. "Bloomberg Eyes Bike Program for Home"
Can I Ring Your Bell?